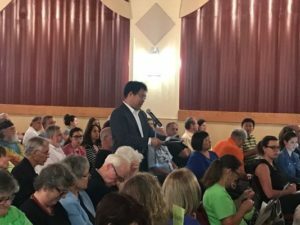 On July 27th 2017 at the County Center, about 300 local residents attended the first public Westchester County Airport Master Plan Public Hearing since 2013. They also noted that the curfew remains in place. There were 29 speakers at the public hearing, 28 of which expressed major concerns about the airport master plan. Nearly all of these concerns centered on the expansion detailed in the document. The speakers criticized the consultants for failing to perform meaningful analysis, risking the environment and public health, increasing noise pollution, conflicts of interest (the master plan consultants are also bidding for the airport), and assisting in a corporate giveaway scheme at taxpayer expense. County Legislator Ken Jenkins (District 15) spoke out against the efforts to hide the master plan not only from public but also from the county legislators’ view. County Legislators David Gelfarb (District 6), Catherine Parker (District 7), Alfreda Williams (District 8), Catherine Borgia (District 9), and MaryJane Shimsky (District 12) were also in attendance. At his Ask Astorino Town Hall in New Rochelle on July 24, County Executive Astorino discussed airport privatization, then at minute 7:12, he discusses the master plan, noting “what is mostly the case, is this master plan sits on a shelf somewhere in Washington, and is never utilized.” Either Astorino wasted $1.4 million of taxpayer money on the plan, or he is being disingenuous and trying to sneak his terrible plan past public opposition. Journal News, “Westchester airport plan ‘deeply flawed’, locals say. July 28 2017. A 2-page handout about the Airport Master Plan can be found here. We are opposed to the county’s efforts to privatize the airport. Additionally, the county’s airport master plan calls for dramatic expansion that will harm our neighborhoods. Contact your county legislator and ask them to oppose privatization and the master plan. Ask your town government to get involved by lobbying the County government. Noise complaint form – do not be shy to complain! The FAA requires records of complaints in order to pursue any noise mitigation program.